So you have finally decided to move forward on a new home remodeling project. One of the initial items that should be on your home remodeling checklist is establishing a home remodeling budget. By determining your home remodeling budget up front you can prevent yourself from financially undertaking too large of a home remodeling project. In addition, a home remodeling budget also helps to determine how much financing will be required. Creating a home remodeling budget also assists you in the planning stages of the project. As you flesh out your home remodeling plans you can budget funds for each phase of the project. Generating a home remodeling budget also prepares you better when talking with home remodeling contractors. When creating a home remodeling budget I have found it useful to create a spreadsheet that contains major categories, such as Excavation, Foundation, Framing, Rough Electric, etc. and within each one of these major categories separate break-out lines for individual cost items that automatically role up under the major categories. In addition, I like to include planned and actual cost columns so that I can track every phase of my home remodeling budget throughout the life of the project. 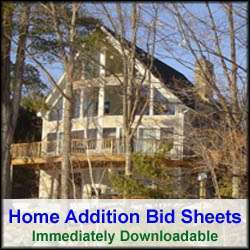 If you would like to download one of my Microsoft Excel based Home Remodeling Budget Spreadsheet templates and its associated Bid Sheet, check out my Home Addition Bid Sheets and select one that is appropriate for your home remodeling project. The home remodeling spreadsheets are editable and automatically role up category and total home remodeling costs. So whether you are building a new home addition, remodeling a kitchen or bathroom, or finishing a basement or attic, always start out by generating a home remodeling budget. From there you can then move on to creating detailed home remodeling plans, and putting your project out for contractor bids. By doing so, you will help reduce the risk of cost overruns and ultimately achieve a new living space that meets your personal and financial goals.